In 2008 the UK economy collapsed into a crisis from which it has yet to recover. Despite the endlessly repeated Tory rhetoric that this crisis was caused by the Labour party, the real cause of the crisis was a global spree of reckless financial sector gambling, often on extremely complex financial products that the buyer clearly didn't even understand. The Labour party were somewhat to blame for not only refusing to undo the financial sector deregulations of the Thatcher era, but actually even further deregulating the financial markets themselves. But the only Tory complaints at the time that Labour were further deregulating the financial sector were that Gordon Brown's deregulations hadn't gone far enough, and that the UK should strive to be more like Ireland! Reckless financial sector speculation caused the global financial sector insolvency crisis and necessitated the biggest state subsidies in economic history to prevent the UK banks collapsing into their own black holes of debt. The problem is that it doesn't matter how much evidence there is that deregulated capitalism caused the financial sector insolvency crisis, the Tories and the right-wing dominated press are absolutely determined to create the simplistic narrative that the Labour party, and welfare spending are to blame for the fallout from the financial sector crisis. The Tory narrative is that the Labour party "bankrupted" the economy with their excessive welfare spending, and the actual facts of the matter are irrelevant. Instead of attempting to offer an alternative narrative built on the actual facts, such as the fact that the bankers' bailouts cost more than the entire national debt that the Tories endlessly fearmonger about, the Labour leader Ed Miliband has decided to capitulate. Instead of attempting to counter the "blame Labour" right-wing rhetoric with the truth, Miliband and the shadow Work and Pensions secretary Rachael Reeves have decided instead to try and out-Tory the Tories. Their latest plan is to revoke social security for 18-21 year olds, and replace it with a pitiful benefit only payable if the youngsters do workfare or training schemes. No doubt the same alphabet soup of extremely dodgy corporate outsourcing parasites (A4e, G4S, Serco, Sudexo, Capita, Atos ...) will be lining themselves up to administer the Labour party workfare schemes, and provide the Labour party "training" schemes, just as they have cashed in for the last four years administering the Tory parties workfare schemes and the Tory parties "training" schemes (in which people are "trained" at the taxpayers' expense how to wipe their bottoms by these companies). In my view a much more sensible strategy for the Labour party would have been to attack the Tories for the fact that long-term youth unemployment has risen 57% since the Tories came to power in 2010, and that this huge rise has come despite the ever increasing use of workfare schemes designed to artificially exclude hundreds of thousands of (mainly young) people from the unemployment figures, even though they still receive unemployment benefits throughout their term of compulsory unpaid labour. This astonishing rise in the rate of long-term youth unemployment is by no means the first example of the gross incompetence of Iain Duncan Smith providing Ed Miliband with a huge stick to whack the Tories with, but Ed preferring to set about beating himself over the head with it instead. Back in February 2013 the Cort of Appeals declared Iain Duncan Smith's Workfare schemes for the unemployed unlawful, but instead of using this humiliating court judgement to attack Iain Duncan Smith, Ed Miliband and the Labour leadership actually decided to collude with the Tories in order to help Iain Duncan Smith get a vile piece of retroactive legislation rushed through parliament in a single day. Not only did Miliband refuse to attack Iain Duncan Smith for his incompetence, he actually helped IDS to stick two fingers up at the courts by quickly rewriting his own hopelessly botched legislation and applying the changes retroactively so that his workfare rules would have been lawful had they been written that way in the past. Now Miliband is refusing to attack the Tories for the huge rise in long-term youth unemployment since 2010, and instead seems to want to further reinforce the Tory narratives that welfare spending and "scroungers" are to blame for the crisis through his new plan of attacking the pitiful amounts paid out to workless 18-21 year olds, instead of actively doing anything to actually help them. 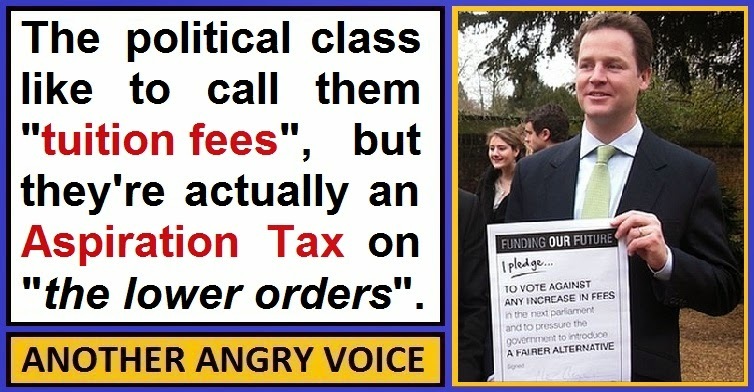 Given that the economic crisis was undeniably caused by the bankers, a much better Labour party strategy might have been to highlight the huge rise in long-term youth unemployment since the bankers trashed the economy and to propose a new tax on bankers bonuses designed to fund paid apprenticeships for young people in real businesses (rather than ludicrous taxpayer funded "how to wipe your bottom" courses with A4e). Instead of developing a strategy which highlights the reckless bankers and the incompetent Tories as the culprits, Ed Miliband's Labour party seem intent on painting the victims of the bankers' crisis as the guilty parties who are deserving of punishment for their "idleness". 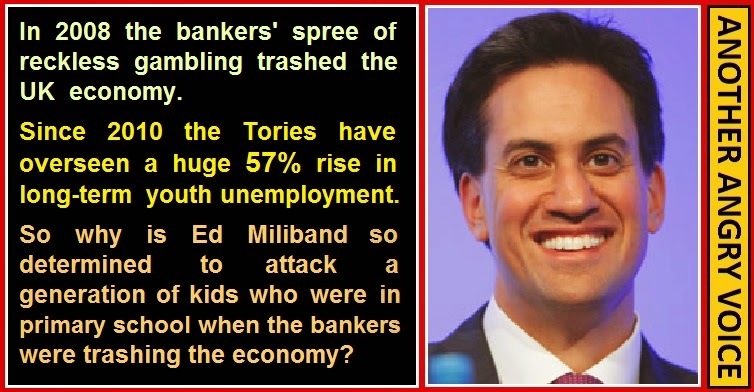 Ed Miliband and Rachael Reeves seem intent on punishing a generation of youngsters who were still in primary school when the bankers were trashing the economy with their reckless gambling spree, because the economy still hasn't recovered sufficiently to offer these kids the prospects of real paid employment. This may seem like a sensible strategy from within the bubble of the Labour party leadership, but to countless thousands of traditional Labour voters it's bound to kill the last vestiges of hope that New Labour offer anything other than vindictive Tory-lite policies designed to appeal to readers of the Daily Mail and the S*n.
This is an open letter to Peter Wardle, the Chief Executive of the Electoral Commission, which is the body responsible for regulation of political parties, and political donations in the UK. I am writing to you in regards to a social media funding campaign which has been conducted by the political party Britain First, an extremist party I'm sure you are very well aware of after widespread condemnation of the Electoral Commission's decision to allow the party to use "Remember Lee Rigby" as their description on European election ballot papers, despite the fact that Lee Rigby's family strongly object to Britain First and their followers desecrating his memory by making him the "poster boy" of their extremist campaign. The specific issue I would like to draw to your attention to is the way Britain First uses social media in order to collect donations. In my view it is important that this issue is investigated in order to establish whether or not Britain First is guilty of obtaining funding for their party under false pretenses. The specific funding campaign I am referring to is a widely shared animal cruelty image, which includes an appeal to donate to a Britain First Paypal account so that they can "stop this cruelty!" (see embedded image). As you can see from the screengrab of this campaign, it has been shared over 790,000 times in just a few days, meaning that it will have been seen in tens of millions of Facebook news feeds. The fact that this image has been so widely shared means that their appeal for donations in the image description will also have been seen by tens of millions of people, and it is conceivable that a great number of people may have donated to this Britain First Paypal account without even realising that they are funding a political party, let alone an extreme-right political party. I have a number of questions relating to the way Britain First have been using animal cruelty images to raise funds like this. 1. Does a fundraising campaign which makes no mention of the fact that the organisation receiving the donations is a political party comply with Electoral Commission rules? 2. Does the Electoral Commission have any guidance for political parties in relation to using social media to raise party donations? If so, is the Britain First "help us stop this cruelty!" fundraising campaign in compliance with this guidance? 3. If there is no specific guidance on how political parties can take advantage of social media platforms like Facebook, Twitter or Google Plus to collect party donations, does the Electoral Commission have plans to introduce any guidance? 4. Does the Electoral Commission consider the use of animal cruelty shock tactics an acceptable form of eliciting party political donations? 5. Have Britain First registered the existence of this Paypal fundraising account with the Electoral Commission? 6. Given that individuals can only donate to UK political parties if they are on a UK electoral register, what steps have Britain First taken (if any) to ensure that donations to their Paypal fundraising account from non-UK registered citizens are returned? 7. Given that UK political parties are not allowed to accept donations from foreign registered businesses and corporations, what steps have Britain First taken (if any) to ensure that donations to their Paypal fundraising account from non-UK based businesses are returned? 8. Given that all of the donations given to Britain First as a result of this appeal were done under the "help us stop this cruelty!" slogan, are Britain First under any legal obligation to demonstrate how these funds have actually been used to prevent animal cruelty? Or can they just keep these donations and do whatever they like with them? 9. Given that all of the donations given to Britain First as a result of this appeal were done under the "help us stop this cruelty!" slogan, what steps (if any) have Britain First taken to segregate these donations from their general funds? 10. If Britain First are under no legal obligation to segregate the funds raised through this "help us stop this cruelty!" campaign from their general accounts, and they are under no obligation to demonstrate how they have used these funds to prevent animal cruelty, what steps would the Electoral Commission take in order to prevent political parties from collecting political donations under false pretenses like this in future? In my view these are very important questions about party political funding and I would appreciate a timely response. If any of these ten questions fall outside the remit of the Electoral Commission, I would appreciate it if you could seek responses from the appropriate authorities, or at the very least, advise me of the appropriate authorities so that I can contact them myself. As a matter of courtesy I am informing you that I have published a copy of this letter on my widely read personal blog, meaning that many of my readers will be as keen to hear your answers as I am. If you send me a statement of responses to these questions for publication on my blog, I will post it on the blog post beneath this letter. 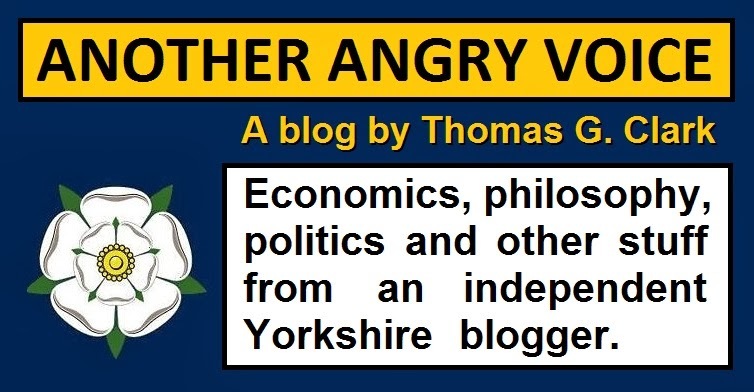 Author of the Another Angry Voice blog. Thank you for your emails to the Commission. The Chief Executive has asked me to reply to you. The Commission is grateful for you bringing these serious concerns to our attention. We are in contact with the police in relation to the allegations you raise of potential criminal offences by Britain First. We are also presently looking into other matters relating to compliance by Britain First with the rules on political party finance that we regulate; and will include the aspects you raise in this regard. It is not appropriate for the Commission to presently make any comment on the detail of such matters. 1. Does a fundraising campaign which makes no mention of the fact that the organisation receiving the donations is a political party comply with Electoral Commission rules? This is not a question of Electoral Commission rules. Rather it is a matter for the police as to whether fraud related criminal offence is being committed. There could possibly also be a charity law concern. We are notifying both the police and the Charity Commission. I would add that the Commission has recommended to government that the law we regulate should be amended to require political parties to clearly identify on their online campaigning material that it is of their political party. 2. Does the Electoral Commission have any guidance for political parties in relation to using social media to raise party donations? 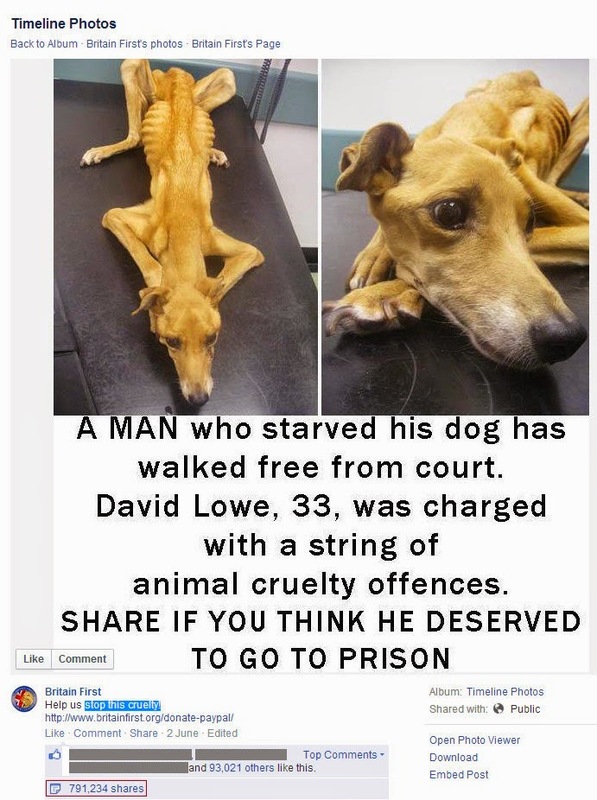 If so, is the Britain First "help us stop this cruelty!" fundraising campaign in compliance with this guidance? Yes, we do have full guidance, because the legal framework for a political party raising donations through social media is no different to using any other means (our guidance is published on the Commission’s web-site).That is, the rules equally apply. This means that donations over £500 can only be lawfully accepted by political parties from permissible sources, and there are requirements for reporting donations from individuals above aggregated financial thresholds to us (£1,500 to a party local ‘accounting unit’ or £7,500 to the central party). In addition political parties have further ‘statements of accounts’ reporting requirements to us, which accounts we publish. All of our guidance, reported donation and statements of accounts are on our web-site. In view of the changing use of social media we keep our guidance under review in this regard. 3. If there is no specific guidance on how political parties can take advantage of social media platforms like Facebook, Twitter or Google Plus to collect party donations, does the Electoral Commission have plans to introduce any guidance? Please see answer to 2 above. 4. 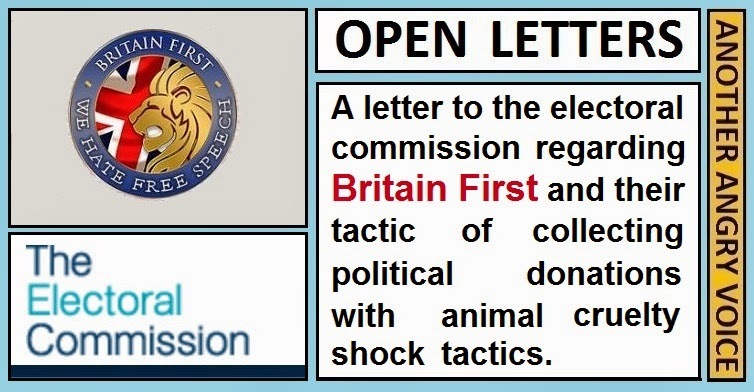 Does the Electoral Commission consider the use of animal cruelty shock tactics an acceptable form of eliciting party political donations?It is not for the Electoral Commission to express a view on this political party campaigning technique. Our remit here is to regulate and ensure compliance with the rules on accepting and reporting political party donations. We also draw possible wider criminal offences or other apparent breaches of the law to the attention of other appropriate bodies, including the police. 5. Have Britain First registered the existence of this Paypal fundraising account with the Electoral Commission? We take your email to be an allegation that Britain First is not complying with the rules. We will be looking into the matter, including contacting the party. If we conclude the rules have not been properly followed, we will consider sanctioning Britain First and, or its responsible officers. 6. Given that individuals can only donate to UK political parties if they are on a UK electoral register, what steps have Britain First taken (if any) to ensure that donations to their Paypal fundraising account from non-UK registered individuals are returned? Please see answer to 5 above. 7. Given that UK political parties are not allowed to accept donations from foreign registered businesses and corporations, what steps have Britain First taken (if any) to ensure that donations to their Paypal fundraising account from non-UK based businesses are returned? Please see answer to 5 above. 8. Given that all of the donations given to Britain First as a result of this appeal were done under the "help us stop this cruelty!" slogan, are Britain First under any legal obligation to demonstrate how these funds have actually been used to prevent animal cruelty? Or can they just keep these donations and do whatever they like with them? Please see answer to 1 above. That the matter you raise is for the police, does not effect that, as indicated, all donations to a political party are subject to the party financing laws we regulate as to permissibility of donations and reporting to us for publication. 9. Given that all of the donations given to Britain First as a result of this appeal were done under the "help us stop this cruelty!" 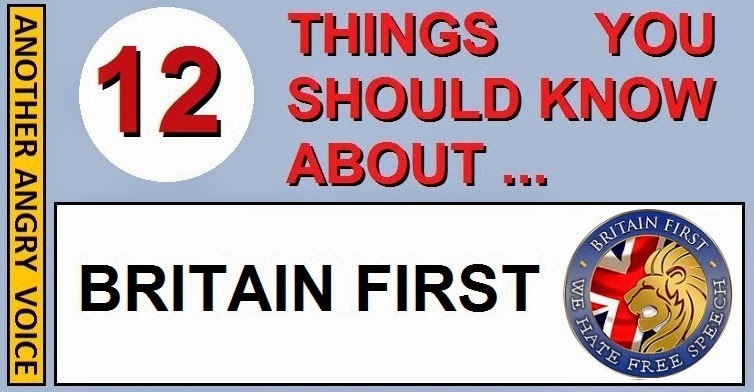 slogan, what steps (if any) have Britain First taken to segregate these donations from their general funds? Please see answer to 1 above. I would add that segregation of funds (or not) would not avoid the requirement for donations accepted by a political party to be permissible and reported as appropriate to the Commission for publication. 10. If Britain First are under no legal obligation to segregate the funds raised through this "help us stop this cruelty!" campaign from their general accounts, and they are under no obligation to demonstrate how they have used these funds to prevent animal cruelty, what steps would the Electoral Commission take in order to prevent political parties from collecting political donations under false pretenses like this in future? Please see answers to 1 and 5 above. I trust this reply assures you that the Commission is taking pro-active steps to deal with allegations relating to Britain First. We will be in contact with you again in due course to let you know where matters get to. The police may also contact you. If you become aware of any other related issues of concern do kindly inform us. Before I get started on this article I'll declare my interests. I am a Yorkshireman, so I suppose that makes me English. I wish my beautiful region had far more autonomy from Westminster, because perhaps if we had, our local representatives would have fought to protect our vital industries (steel, coal, fishing, transport), rather than letting Westminster deliberately ruin them as part of their insane ideological experiment in turning the UK economy into a supposed "post-industrial society" built around the city of London financial sector (and we all know how that absurd fantasy turned out). I know there is no chance of Yorkshire achieving regional autonomy from London in my lifetime, but that doesn't mean I begrudge the people of Scotland their opportunity to end London rule, in fact I'm delighted for them. The only concern I have is the possibility that the people of Scotland will decline this magnificent chance to assert their autonomy. Come September the 18th, I hope I'll be celebrating the rebirth of the Scottish nation. I hope I'll be drinking a toast to "Scotland the brave", not mournfully lamenting for "Scotland the servile". One of the most commonly occurring arguments proffered by the "No" camp, is that should Scotland decide to leave the Union, it would condemn the English to perpetual Tory rule. It is essentially an appeal that Scotland should give up the possibility of autonomy and self-governance in order to mitigate someone else's problem. The first and most obvious objection to this appeal to self-sacrifice is that the numbers just don't add up. The population of Scotland is about 8% of the UK electorate, so even if 100% of Scottish people turned up to vote, and all of them voted against hardline neoliberal parties like the Tories and UKIP, it will count for nothing if the people of England vote marginally in favour of the hardline neoliberal parties. The UK would still end up with a hardline neoliberal government, and Scotland would end up with a government it overwhelmingly rejected. It is a fact that the Scottish vote very rarely has any impact on the overall result in General Elections. Between 1979 and 1997 Scotland voted against the Tories, but the English voted in favour, so we all got a Tory government. Between 1997 and 2010 Scotland voted Labour, but so did the rest of the UK, so even if the Scottish votes were discounted, Labour would still have won, and the Tories would still have been out of power. Ever since the Second World War, the only time the Scottish electorate has played a decisive role in determining the government of the UK is when it comes to hung parliaments, the rest of the time the UK has ended up with the government the people of England have voted for. The idea that England would be condemned to perpetual Tory rule doesn't stand up to the slightest scrutiny because the Scottish vote very rarely actually changes anything, other than converting what would have been a tiny majority into a hung parliament. Even then, in 2010 the Liberal Democrats enabled the Tories back into power anyway, then supported all of their rotten illiberal legislation (Privatisation of the English NHS, Secret Courts, "Bedroom Tax", the Gagging Law, Retroactive workfare legislation ...). The frightening thing is that the next time around it could the nightmare scenario of Scottish votes turning what would have been a small Tory majority into a minority, meaning that the Tories end up having to form a coalition with a gaggle of UKIP MPs to stay in power. Such a scenario would drive the UK even further towards right-wing neoliberal extremism, even though the vast majority of the Scottish votes that caused it were actually cast in support of more social democratic parties. The law of unintended consequences makes it entirely possible that the Scottish electorate could actually make things a hell of a lot worse by sticking with us and trying to mitigate the Tory voting south-east. Because the numbers just don't add up, even if Scotland remains in the union and the Scottish electorate votes overwhelmingly against the blue and purple Tories, it simply won't make a difference if the majority of England votes in favour of them. If the people of England vote for the Tories and UKIP, history has shown that it is extremely unlikely that Scottish votes would be enough to change the overall result and save the UK from the nightmare scenario of another Tory government or (even worse) a Tory-UKIP coalition. Even if there were just enough votes to deny the Tory-UKIP team a majority, Tory rule would probably happen anyway because the burning Labour party hatred of the SNP would probably prevent them from forming a rainbow coalition as an alternative to the blue and purple Thatcherites. If Scotland stays in the UK in order to try to protect the English from themselves, it's more than likely to end up as a pointless self sacrifice, where Scotland ends up with yet another government it voted strongly against. Instead of remaining part of the Union in order to fight a losing battle against the neoliberalism of the Tories and UKIP, I believe Scotland would do the English a much bigger favour through independence. Once Scotland is independent, the political landscape of the country would change dramatically. Most notably the SNP would lose their raison d'etre (and presumably a lot of their voters) meaning they would need to find a new core principle to unify the party. Independence would also have a reinvigorating effect on the other parties too. The Scottish Labour party could perhaps step away from the neoliberalism-lite agenda of the Westminster leadership, and offer the people of Scotland the social democratic Labour party of old that they actually want. The Scottish Liberal Democrats could reform as the Scottish Liberal Party and leave behind the legacy of grotesquely illiberal Tory legislation (secret courts, "Bedroom Tax", the gagging law ... ) that were pushed through parliament with the votes of Nick Clegg's appallingly misnamed party. Even the Scottish Conservatives could use Independence as an opportunity to abandon the Thatcherite handbook of neoliberal dogma, and perhaps try to offer more of the kind of social democratic Conservatism from the pre-Thatcher era, which was a brand of Conservatism that actually resonated with the people of Scotland. Should Scotland vote for independence, the country will almost certainly end up with the slightly left of centre social democratic government that the people of Scotland want. This might well be in the best interests of England because it would provide us with an example of how social democracy can be a viable alternative to Thatcherite dogma in the UK. 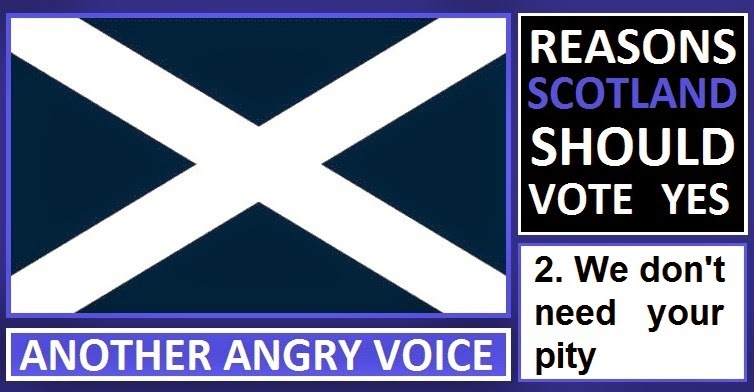 Instead of abandoning self-determination because you take pity on the English, Scotland could do the English a huge favour by leading by example, and demonstrating that there is a better alternative to the Thatcherite neoliberal dogma favoured by the Westminster establishment. In conclusion, you'd be an absolute fool to vote against independence out of some misguided pity for the English. If you abandon your chance at gaining autonomy over your own affairs, the historical record demonstrates that there's actually very little chance that your votes would make any difference anyway. If the English have the terrible combination of gullibility and apathy necessary in order to allow the Tories (or a Tory-UKIP coalition) into power in 2015, there's not much the Scottish electorate can do to save us from our own collective stupidity. All you would be able to do is share the appalling consequences with us, despite having voted strongly against it yourselves. The best thing that the Scottish can do for the English is to vote for independence, then elect a social democratic government of your own. This would show us that there is a viable alternative to hardline neoliberal dogma, and it would show us the value of increased regional autonomy too. Please don't let pity for the English cloud your decision in the Scottish independence referendum. We don't need your pity and pointless self-sacrifices, what we need is for someone to show us that there is actually a better way of doing things.